Is Ignorance Truly Bliss In Regards To Security? In needs to be understood that security is not just hardware or your security system but compromises of various other elements such as control and information. Security is knowledge. Security is control. Security is management. Security is willpower. The Security Risk Assessment will assist you in making your company as crime resistant as possible. You will have the necessary security knowledge in terms of crime and solutions in a living document and detailed report. Although it could be considered by some within the corporate sphere that ignorance is bliss, what would happen if security was not efficiently addressed and the company was targeted by criminal attack? Would the same be true if the company lost valuable equipment and even data as a result of crime? What if one of your employee’s was gunned down during such an emergency incident? Insurance may cover the costs of physical asset loss but can never replace a life – be it a spouse, a parent, a sibling or friend. The independent Security Risk Assessment will provide you with all the necessary security knowledge to prevent crime from occurring in the workplace. 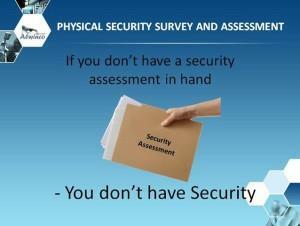 Without an assessment in hand, your company does not have security. You will be provided with security knowledge covering crime, the opportunity for a crime to occur and the vulnerabilities and risk found within your current security status. Further security knowledge is provided in terms of solutions to best protect and secure your property. A factor that contributes to this is that while Health & Safety is governed by legislation in South Africa, security is not. In other words, it is strictly prohibited that you fall and break your leg in the workplace. In that case, the company will be held liable and responsible, but not in the event that you are a shot by an armed criminal during such an attack. Health & Safety and security also find themselves in opposition at times. For example, the Health & Safety Officer would want a back door to open easily to allow exit in the event of a fire but the Security Manager would want it to stay locked so that a lawbreaker could not sneak in at that point. Although the examples I have used are simple to explain my point, it still does give food for thought. Consider the fact that in South Africa we are actually blessed as we are not as prone to natural disasters as other countries in the world are. Yet the biggest disaster we need to face is actually crime. This does not only include robberies or hijackings but covers strikes too; where individuals within a group adapt the ‘mob mentality’ and breakout into violence and destruction. Many professionals agree that the security knowledge within the Security Risk Assessment is a necessary requirement in the process of effective Disaster & Emergency planning and management. Realising that a vast majority of such incidents could actually have been prevented, or at worst that safety would need to kick in when security fails, would you still prefer to be one the blissfully ignorant? Be Always In Control through the independent Security Risk Assessment which will provide you with the relevant security knowledge, information and recommendations to be in control.